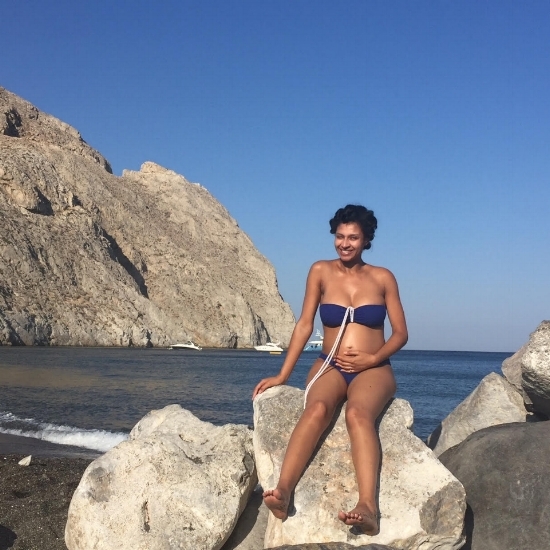 A Thanksgiving horror: 9 months pregnant and left waiting hours for food | Honeycomb Moms | About four months before my baby was born, I was on a beautiful beach in Santorini honeymooning. I placed my order on Nov. 11, 2017 and arranged a Thanksgiving day pickup. Then, I went on about my life per usual, working as a reporter at The Atlanta Journal-Constitution, getting the nursery ready for my growing baby boy and trying to keep up with all the extra meals he required. When Thanksgiving morning arrived, I was not only relieved, but thrilled I wasn’t cooking. Donzell was sick. I was less than one month away from my son’s birth. And with no immediate relatives in town except my visiting mother Michelle Breland, we just didn’t have a lot of helping hands to prepare a meal. We barely had enough people to pick up the meal when our noon pickup time arrived, but my mother and I managed. We gave the restaurant workers about a 30 minute grace period because they tended to run late, and we made it to the location in the 3500 block of Camp Creek Parkway at about 12:30 p.m. When we walked through the front doors, there was a line snaking toward a cash register opposite us, but that wasn’t our line. A staff member explained to my mom that catering orders were handled in a back room and there was a separate line for that. We waited in it about 30 minutes. Then, another staff member confirmed our order and handed us a ticket. I thought that was a good sign, but I thought wrong. When my mom and I earned a spot in the coveted backroom, we learned it was merely a second waiting area no bigger than an elementary school’s basketball court. About two staff members manned the area. Chairs lined the perimeter of the room, and seats weren’t immediately available, but the area wasn’t packed. We could see the disposable pans of food awaiting their owners, and every 20 minutes or so one of the staff members would yell customer names. Their orders were ready. My mom and I had waited about an hour by the time two chairs opened up. We pounced on them and chatted through the second hour of waiting with no problem. We were in good spirits. The ladies sitting next to us — out-of-towners catering a meal for their extended family — were hilarious. The few staff members manning the room were pleasant, and they even allowed us to get cups of juice and pop for free. “Do you want me to get you something to eat,” my mom asked me. “No, I’m fine,” I responded. I didn’t want to ruin my appetite on Thanksgiving. Plus, I wanted the food we had already paid for, not to pay more money. I changed my tune when our two-hour Thanksgiving day wait turned into three. By that time, my stomach was growling, and my baby was twisting and turning. I worried that he was starting to feel how uncomfortable I was, so I had my mom go get us something to eat. She left the crowded back room to the front of the restaurant. And when she came back about 20 minutes later, she was speaking slowly in the measured way she does when she’s furious but trying not to react. She explained that she had walked to the front of the to-go line and asked a staff member if she could please get something to eat for her pregnant daughter who had been waiting for her pre-ordered meal for hours. Oliver Twist style. Fittingly, the woman explained that my mom would have to pay for an additional meal. She did, and I devoured it. I understood why my mother was upset. As someone who eats out frequently in her hometown of Chicago, she was used to a certain amount of common decency. A restaurant botches an order or has an unusually long wait, and the manager apologizes and offers something complimentary. But not this restaurant. The manager cowered away out of the public’s view and would not come out even when requested. I only know he or she was even there because a staff member let it slip while complaining about having to deal with frustrated customers. I heard one man explaining to a worker that he was trying not to go off like an earlier customer but that seems to be the only way he could get his order. Another family held its tongue through a more than five hours. I know the group had to be frustrated. I was frustrated. I also felt helpless, and that was more frustrating. I couldn’t believe a restaurant would treat its customers so poorly. I mean the food is good, but no food is that good. The mood got so tense, one of the workers started calling out how much people who hadn’t picked up their orders had paid for them. The alleged manager apparently reprimanded her for that because I heard her explaining to a coworker that she was only trying to lighten the mood. She left in tears before reappearing later. We asked a different staff member when we could expect our food, and he gave us an estimate, and later, another estimate. At the four-hour mark, I stopped counting. I could hear the staff member who earlier left to cry explaining to a peer why the wait was so long. She said another worker at the restaurant had been giving his friends the VIP treatment, so the kitchen was now having a hard time fulfilling the prearranged orders. At that point, I wasn’t even angry anymore, but I did consider pitching a story about the incident to the newspaper. I talked myself off the ledge. In the world of journalism, you want to report the story not be the story. So I kept my mouth shut and waited until we finally got our food. It was after 5 p.m., my mom said, looking at her photo timestamp. I vowed then that I would never go back to that restaurant. I left following up with the manager for a refund to my husband. I didn’t want to take on anymore stress so close to my due date, and I have a tendency to go all the way down the rabbit hole in these kinds of situations. My husband sent the business an email, which was never returned, and on Dec. 18, 2017 our son, Donovan, was born. First-time parents, we were over the moon. We fell madly in love with Donovan, and it feels like we fall a little harder each day. Over time, the Thanksgiving situation became nothing more than a funny story we told friends. The anger faded, but I still haven’t forgotten how I was treated and how it made me feel. Hunger pangs and frustration aside, what lingers is the feeling that the everyday customers weren’t important enough to be treated fairly. We didn’t matter as much as the restaurant’s need to make money. I felt helpless. I felt disregarded, and I felt devalued. No one should pay to feel that way. 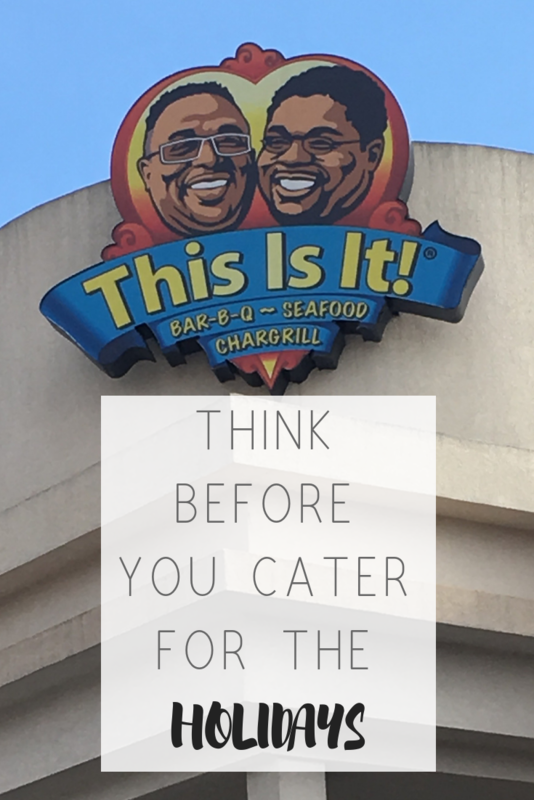 A Thanksgiving horror: 9 months pregnant and left waiting hours for food | Honeycomb Moms | My mom and I ended up waiting more than four hours for our catered dinner at the This Is It! BBQ and Seafood restaurant in the 3500 block of Camp Creek Parkway in metro Atlanta. Wow, this is unbelievable. I’m so sorry this happened to you. I’m glad your mom was there with you. It’s only because of her and the other customers that we weren’t totally miserable. We joked and laughed about it and tried to make the best of the situation. I was reaading this and getting more and more mad. This is absolutely HORRIBLE to experience and pay for. What a way to ruin a holiday! A true nightmare! Oh wow! That is insane. So until this day, they’ve never gotten back to you? I can’t understand that. And you stood for an hour and no one offered a pregnant woman a seat? Girl! You would be surprised how rude people are even in the South. Oh wow! Terrible! So sorry that you had to deal with this. That is ridiculous!!! I don’t think I would’ve been able to hold my tongue after 5 hours and if my mother was there it wouldn’t have gotten that far. Lol that lady can be ruthless. Have you heard anything back from this at all ? I’m so sorry you had to deal with this. I haven’t heard from them at all, but to be fair I didn’t follow up a bunch of times either. I just wrote them off. This is unacceptable service! Especially when you’re almost at you’re due date, they should’ve been more accommodating and given you more than just a complimentary meal! I would never return. I’m sorry you had to deal with this. I’m also a journalist, so I’m glad you decided to tell this story to warn others. Girl I live in Atlanta and i never would order from This is It! I am glad you are speaking your truth of how unprofessional they were to you this is unacceptable! Wow!! This is TERRIBLE! Idk why businesses are comfortable treating people like this. If you don’t have the capacity, don’t add gradiose money opportunities to your offerings. It’s better to just do what the hell you can manage. This story is so ATL to be, having lived there for a short while. At the very least an apologetic tone would be expected. Waiting for food is the worst! So sorry you experience such horrible service for Thanksgiving! I may have lost it. I love "report the story not be the story" because honestly? Me? Pregnant? Hungry? I would have been the story indeed. I have no idea why people don’t tell folks that things are going awry and they have to wait. This is horrible!! And especially because you’re pregnant! So sorry you had such a horrible experience…but I’m glad you had your mom with through all of this! Oh wow, that’s a horror story indeed! Glad you can look back on it as a funny story now that it’s in the past!